LineageOS 15 for Moto X Pure (style) (clark) is now available to download via an EXPERIMENTAL development build. 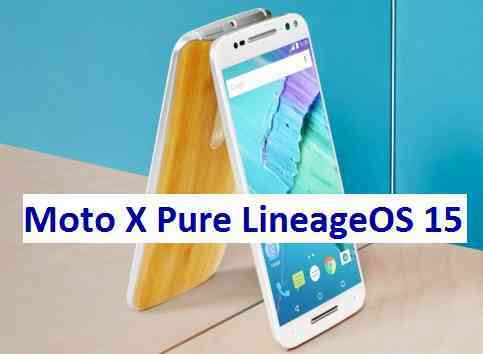 This post provides the download link to the Android Oreo based Lineage OS 15 for Moto X Pure (style) (clark) and guides through the installation process of the same. This LineageOS 15 for Moto X Pure (style) is brought to you by developer HashBang. If you want the OFFICIAL Lineage OS 15 update or some more Android Oreo ROMs then stay tuned to the LineageOS 15 ROM page or the AOSP Oreo ROMs devices list page. Reboot and Enjoy Android Oreo with LineageOS 15 for Moto X Pure (style). Copy the latest Lineage OS 15 for Moto X Pure (style) Oreo ROM ZIP file to the phone. Stay tuned or Subscribe to the Moto X Pure (style) (clark) forum For other Android Oreo, Nougat ROMs, LineageOS 15 ROMs, other custom ROMs and all other device specific topics. Great job HashBang! I’ve been waiting for this ROM for a long time … Downloading and testing now! I’m attempting to install lineage-15.1-20180513-unofficial-clark and I get “ERROR: 7 This package supports bootloader(s): 0xA050, 0xA052; this device has bootloader 0xA01C.” I am attempting the install on a XT1575 clark device which I have previously been running LineageOS 14.1 without problems. Any way to whitelist this bootloader? Can you tell me which TWRP are you using? Can you use the latest TWRP available for your device and try installing once again? 3.2.1-0 which is the latest for clark. Okay got it. My apologies for interpreting this wrongly. Looks like you have a bootloader version of A0. 1C but the build is only for A0. 50 and A0. 52. The MBM Version tells you the bootloader version. Can you flash the following stock ROM which has the A0. 52 bootloader and then try installing this LineageOS 15.1 for Moto X Pure? I’ll give it a shot. Can I just use TWRP to flash that stock ROM? Also, can you confirm that bootloader will not be locked?